and other fascinating things I found while working surfing the internet last week (yes procrastination is my new job and I have decided just to give in to it and go with the flow). Well he has just made it to No 1 on the American Billboard charts with his song, Someone I used to Know. Gotye (real name Wally De Backer) is the first solo Australian to hit number 1 since Olivia Newton-John racked up 10 weeks at the top in 1981 with Physical. Rick Springfield was the last solo male Australian artist to reign with Jesse’s Girl 31 years ago (no-one will admit they remember that song). Savage Garden were the last Australian group to hit number one in 2000. Have a listen, he may look like his name but I will guarantee you will be humming this all day. Best of all he is an independent artist from Melbourne and has been struggling for 10 years. Must be making all those big labels a little sorry right about know. 2. What would you do for five bucks? Nothing much I bet. So why don't you go visit Fivver.com. No, you really, really, really have to because you will not believe what people all over the world are willing to do for just $5. I spent $20 there today hiring people in four different countries to do something for me. I will show you what they have done when its finished. Even I don't believe it could be possible. 3. Do you love Art? This blog, This isn't happiness is a beautiful art scrapbook. It is one of the top 100 websites in the world and the blog has over 250,000 followers. PG rating. 4. Want to bring anyone back to life? Did your see the footage of 2pack (real name Tupak Shakur) performing with Dr Dre and Snoop Dog at Coachella 2012 Music Festival? No, I wouldn't have either except that someone told me Tupak actually died in 1996. The special effects holygram was done by an LA digital studio. I am just hoping Joe Jackson doesn’t get any money making ideas to trot a Michael Jackson holygram out and take him on a world tour. It is freakingly real. 5. Think you are too old for high fashion? Then go visit a blog called Advanced Style and be inspired. 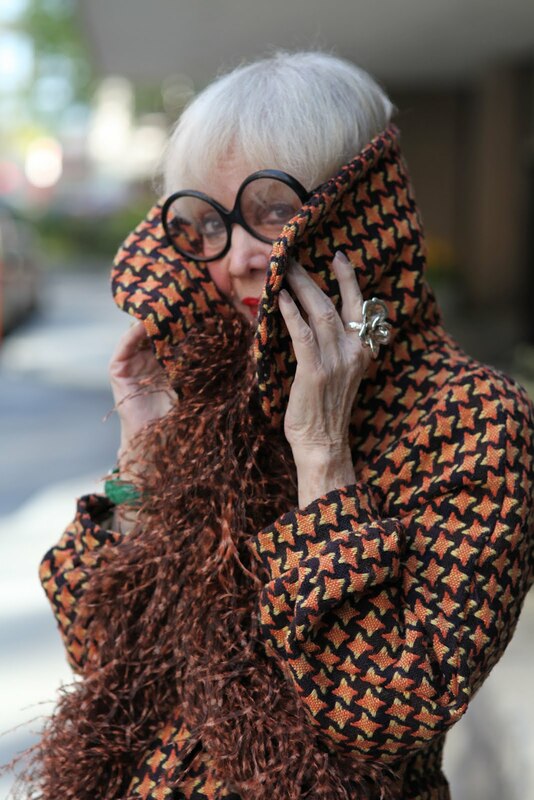 Blogger Ari Seth Cohen roams the streets of New York looking for the most stylish and creative older folks. Let these ladies and gents teach you a thing or two about living life to the fullest. Advanced Style offers proof that personal style (and bravery in some cases)advances with age. Have a great weekend everyone. I am off to visit the home of a silent Hollywood movie star who married an Australian grazier three weeks after they met. She moved with him to his farm near where I live. They spent decades together before they both died in the 70s. They left their estate to the goverment and the farm continues to operate as a working farm and has generated many millions of dollars for the community since. Their homestead, left as they had it, is open to the public every so often. It's a love story that should be a Hollywood film. A most unlikely match. I will tell you about it next week. "addicted to a certain kind of sadness" - he has the voice to go with the words. The painting of him to match the wall was cool. And I remember Jesse's Girl! You have me curious about the 5 dollar site. I'll have to check it out! I watched as Gotye performed on Saturday Night Live .. really enjoyed the music. Now I must rush off to the older folk fashion place .. always interested in a few tips! Thanks so much for liking my Jennifer poem. Before I forget - Yes I remember "Jesse's Girl". The song not the actually girl but she sounds lovely. I liked that Gotye song. Singing naked probably increases it's appeal. Anyone can get naked but to be able to sing in your birthday suit takes willpower or something (alcohol ?). You didn't mention the girl singer who joins in the Gotye song. At first I thought it might be Katy Perry but she is a big hit Kiwi named Kimbra. Hey what do you want done for a fiver? I could use some cash. Will be checking out those sites. Sounds like you have a great weekend planed! Yes can't wait. You just never know what kind of stores you can find out in your own little town. Have a good weekend Betty. I find lots of stuff and never know what to do with it. love the internet..
Have you seen Rick Springfield of late? Plastic surgery anyone? Why oh why do people do it? Yes Kimbra - never heard of her here but has a great voice. You need to go sign up on that site, strange as all hell but fascinating. Advanced Style is out there to say the least. Jennifer is beautiful, just like you Helen. Sounds like you are close, can't wait till I am a grandmother!! Yes its a good theme song for sad times hey? You remember Jessies Girl? He went into a television soap after that didn't he? Yes go the the $5 site, you will be amazed. I used to love 2pac but there is no way I would let my kids listen to crap I mean music like this. I think that is creepy makiam typing this on my phone so who mnows ehat this is going to end up as.ing money off the deceased . Forte is No 3 in the UK and I really like it. Go Wally! Hmmm... I'm sure I've seen this $5 ad on TV but for the life of me I just can't recall if its Maccas or Hungry Jacks! Hey Sarah were you drinking when you sent this comment, lol. I think I get it. Gotye is no 3 in the UK too? Yeah and it is a little, well a lot really, creepy about 2pac. Let him rest already. Well that was embrassing, my fat fingers cannot fit on my Blackberry keys and I end up sending gobbdlegook. But you understood at least...thanks. I would quite like to bring my father back to life. But then he would probably have a go at me! Hope you're well, Lilly. Lol, my father is still having a go at me, his words will forever live in my memory, thank goodness. He gave so great advice to me over the years. Thanks for visiting Mike. I have the same problem with my Blackberry. Fat finger syndrome..
Um sorry, if my grandmother left the house looking like that I would be hugely embarassed. Oh but Anton this in NYC we are talking about. Besides why is it more acceptable for younger people to wear outlandish fashion and not older people. I bet they have dressed like this all their lives. I think it is wonderful. Brave but wonderful. I would not have dared to do it at 20 let alone now. Hi Lily, im enjoying your new artist! Also, as I get older, I find it hard to dress. I mean, i want to stay fashionable, and yet sometimes I wonder am I not acting my age, lol...i'll have to check that out! and cant wait to hear about that estate. I hope your well. I had scans on Friday, i will find out tuesday where i'm at...please keep me in your thoughts. Hi Dawnie, you are always in my prayers and even more so for Tuesday. And yes I know about the staying fashionable bit. The older I get everything gets lengthened, necklines, sleeves, hemlines, waistlines, lol. Love you! And top of the now doubt evening back at you Dar, will come over for a visit soon. The correct url would be http://fiverr.com/, no? And thanks! Thanks, I think the link still gets them to the site. how interesting about Gotye - I've seen it every week at the gym and still have no idea but I'm mesmerized by the video.